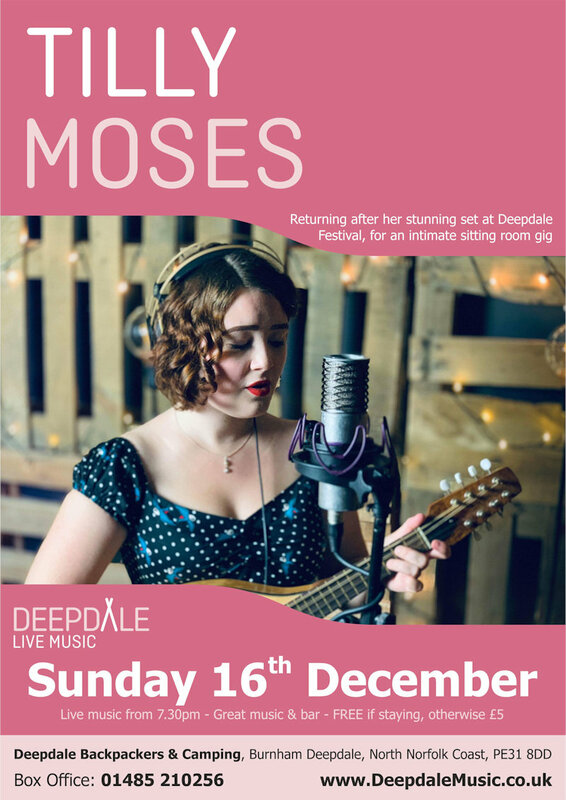 The live music programme at Deepdale Backpackers & Camping continues with a sitting room Sunday Session from the scintillating Tilly Moses. Fabulous to welcome her back after her mesmerising performance at Deepdale Festival. If you haven�t yet heard Tilly, you are in for a treat. A rising star of the UK folk scene, writing tremulously poignant songs, based in the deep traditions of the English folk tradition. Lyrically rich and delicately sung and performed on mandolin and harmonium, Tilly has opened for many of the greats of UK roots music, including most recently the legendary Bridget St John. Her songs have been played on BBC Radio 1 and 6 Music and BBC Introducing call her �a tremendously exciting artist, regardless of her age� while The Folkroom think she�s �a cult figure in the making. Come along and see her right now! Tilly Moses - Sunday Session at Dalegate Market - The live music programme at Deepdale Backpackers & Camping continues with a sitting room Sunday Session from the scintillating Tilly Moses. Fabulous to welcome her back after her mesmerising performance at Deepdale Festival.